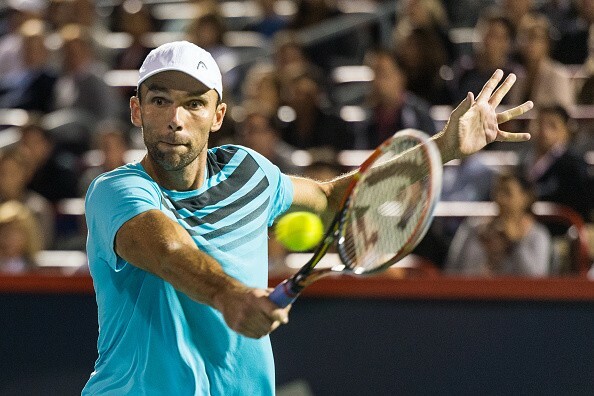 Ivo Karlovic started his Cincinnati Masters campaign with a 6-4, 6-7(3), 6-3 win over Gilles Simon on Monday. Karlovic won 69% points off his serve in the opening set that included eight aces. He converted one of his four break point opportunities in the ninth game before wrapping up the first set. The second set was a lot closer with either player unable to convert their break point chances. Simon squandered six of them as the set went to a tie-break. The Frenchman edged out Karlovic winning 33 points in the set to the Croat’s 32 after couple of mini breaks. Simon continued to struggle on Karlovic’s serve and crumbled when it mattered the most. Karlovic needed just a solitary break in the third set to progress to the second round. After crossing 10,000 aces in his win over Milos Raonic at the Montreal Masters, the Croat hit 35 aces in his win over Simon yesterday. He is closing in on Goran Ivanisevic’s record of 10,183 aces. His current tally is 10,058. Karlovic is averaging 23 aces per match in 2015. Karlovic will take on Martin Klizan in the second round. Klizan got the better of Dominic Thiem 7-6(5), 3-6, 7-6 (4). In other results, David Goffin rallied from a set down to out qualifier Yen-Hsun Lu 5-7, 6-3, 6-4. Goffin will take on either Jo-Wilfried Tsonga or Fernando Verdasco in the next round. In an upset of sorts, lucky loser Benoit Paire beat Gilles Muller 7-6 (5), 7-6 (6) to advance to the second round where he is scheduled to face World No. 1 Novak Djokovic. Another Frenchman to bow out of the tournament on Monday was Gael Monfils, who lost 4-6, 5-7 to Jerzy Janowicz. No. 16 seed Grigor Dimitrov needed three sets to beat Lukas Rosol. Roberto Bautista Agut beat Pablo Cuevas 6-3, 6-4. Thomaz Bellucci beat Jiri Vesely 7-6 (5), 6-2. Mardy Fish beat Viktor Troicki 6-2, 6-2. Thanasi Kokkinakis beat Fabio Fognini 4-6, 6-2, 6-3. Vasek Pospisil beat Denis Kudla 6-4, 6-3. Andreas Seppi beat Adrian Mannarino 6-3, 6-3. Jack Sock beat Bjorn Fratangelo 6-1, 6-2. Joao Sousa beat Philipp Kohlschreiber 6-2, 6-7(5), 6-2. Bernard Tomic beat Sergiy Stakhovsky 6-4, 6-3.